6/1/2016–Waxhaw, NC–Congratulations are in order for C/2d Lt Anthony Giaimo for receiving an appointment to the United States Air Force Academy for the class of 2020. 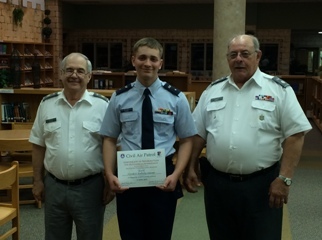 Currently the Cadet Executive Officer for the NC-300 Composite Squadron of the Waxhaws, C/2d Lt Giaimo has been a member of Civil Air Patrol since July 2012. His appointment is the culmination of many outstanding personal achievements including an impressive high school career and exceptional commitment to his community and CAP. C/2d Lt Giaimo will graduate from Cuthbertson High School this June. He speaks 4 languages, is proficient in computer programing, is the captain of his robotics team and swims on two different teams. He also enjoys directing and editing films and playing the oboe in the Cuthbertson High School orchestra.